Going to a country with an alien culture to that of your own can be unsettling and confusing, especially when the country has such a defined way of life as Japan does. 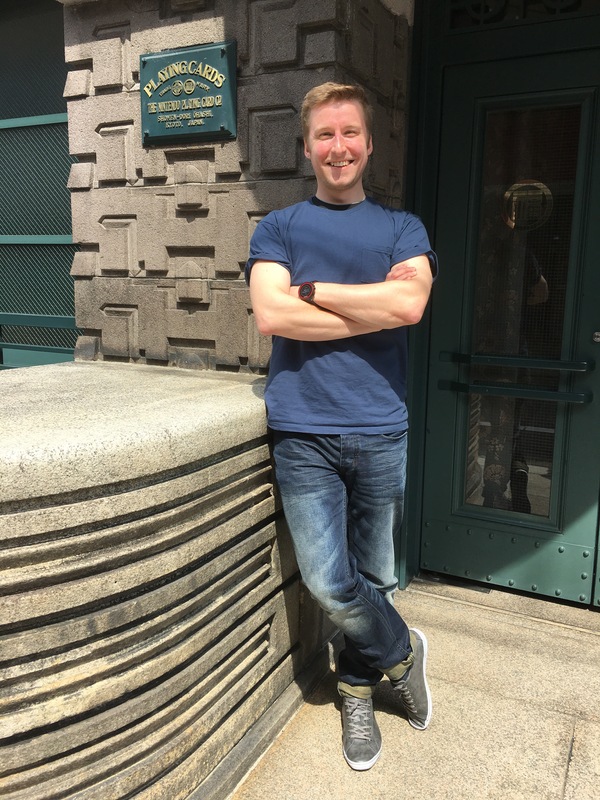 On a trip there for two weeks, I came across a few things that nobody told me about before I arrived but will hopefully provide you with a head start if you’re preparing for a visit. Note: I’m from Britain and so some of this post relates back to my own country. I learnt a small amount of Japanese before I went and took a pocket book to help me. This was enough to get by, though a few times I struggled to get my message across. Most people speak a bit of English so as long as you can indicate you speak English you won’t have much trouble. If you can learn a few set phrases at least you will show you made an effort and be looked a little more favourably on. We saw Tokyo, Kyōto, Osaka, Hiroshima, Miyajima and Nara in two weeks. This was made much more affordable by having the Japan Rail Pass. Just get it. It’s brilliant. [Note] I should add a caveat. If you’re going to go to one city only, this might not be the best option. For example, going to Tokyo to go to the 2020 Summer Olympic Games. You will probably just be based in a hotel very close to the Olympic Stadium and surrounding venues. There might be cheaper options that can be easily discovered with a bit of Googling on trips between your hotel and your destination. Yes, they are amazing. You can travel the length of Britain in about two hours. They’re always on time. They’re almost silent. There’s loads of room on them. They swivel the chairs around so you always face forwards. That said, don’t think it’s going to be as entertaining as a roller-coaster or a trip to the cinema. Take a book or a pack of cards. Cigarette smoking is surprisingly frequent. The rules on it are essentially the reverse of the U.K. There are designated places to smoke outside and you are not allowed to smoke whilst walking in most places. This is good for people who are fit and healthy and get around by walking and resolves a huge bugbear of mine in the UK. However, inside is another matter. Most restaurants still operate smoking and non-smoking areas like the UK had up until the 1990s. Some restaurants we visited didn’t even have non-smoking areas and people generally aren’t considerate at all of other people’s desire to not second-hand-smoke, meaning when we were hugely hungry we just had to deal with it. 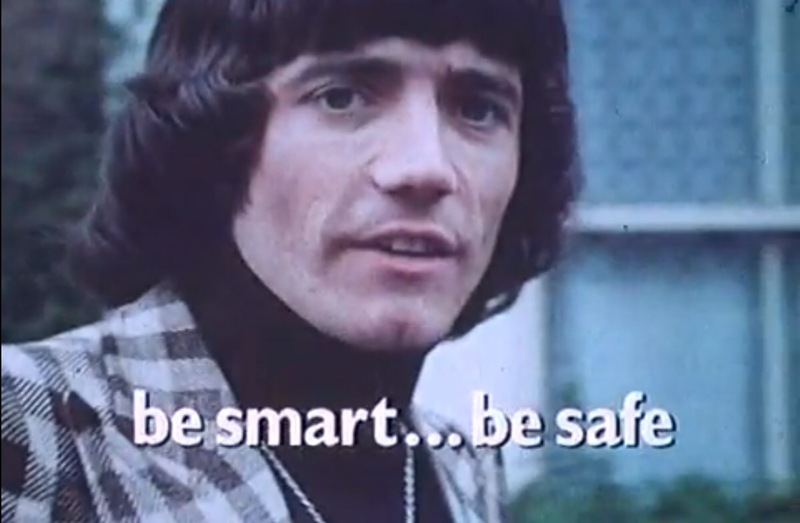 I was begging for a Kevin Keegan video telling me how to cross the road safely. Generally, crossing roads outside of designated crossings is a no-no when crossings are available. Crossing the road when the red man shows is generally frowned-upon. Basically, pedestrian-wise you just have to be patient and sensible and do whatever anyone else is doing. Surprisingly, if only for British residents, you can wait for ages for a green man to show, then just as you cross the road a car appears from a side road. Initially you’ll doubt yourself because it seems so unusual. Then once it’s happened a few times you’ll realise it’s because cars are allowed to enter a main road from a side road when a pedestrian crossing is on green, as long as it’s safe to do so. Don’t worry, they won’t run you over. You’ll just feel like they’re about to. Some of the taxis look like police cars. Specifically police cars from a 1970s American police show. I don’t know why. I was in a train station looking like a tourist, with my map out, a huge rucksack on my back and a gormless look on my face. Suddenly a strange couple started approaching me and tried to say something. My immediate thought was to say “No, I don’t have any change.” Then I realised the woman was asking where I was going. She then proceeded to give me full directions then asked me where I was from and how I was finding the country. We exchanged a short conversation and then she wished me luck on my quest. There are some seasonal-specific activities that you can’t do at all times of the year and even if you do try to do them you might get unlucky with the weather. We had to weigh-up seeing the sakura (cherry blossoms to people outside Japan) with climbing Mt. Fuji. The former has a short window of opportunity that you can achieve best by visiting around the start of April. The latter is only permitted for three months a year, from early July to mid-September. Outside that time you are only going to get to one of either the fourth or fifth stations at best, which are just essentially a café and bus stop halfway up a windy road that you can take a photo from. In hindsight the bus tour to Mt. Fuji, organised through JTB and Sunrise Tours, was very disappointing and we didn’t feel we got our money’s worth from it. It took a whole day out of our holiday and we spent almost the entire time on a bus, leaving with the feeling we could have spent the time in much better ways. Be prepared to walk. A lot. The subways and overground trains are fantastic and the big cities all have phenomenal networks connecting them. However, they only take you so far and once you’re near it’s usually common sense to just walk the remainder, taking advantage of the safe, clean and beautiful surroundings. I had my sports watch on a few days and we usually clocked up upwards of 5km on each day, with a peak of just over 7km. People walk much faster than in the UK. I am a genuinely very fast walker and rarely get overtaken in the UK. In Japan people were zipping past me all the time. There is one exception: when they are distracted by their mobile phones… Which is about 50% of the time. The number of people who don’t have the ability to walk from A to B without spending the entire time engrossed in their phones is unbelievable and quite funny. The reason we can’t do this in the UK is the likely possibility of standing in some unattended dog excrement – an event so likely that we have to spend most of our walking time looking at the ground. This would never happen in Japan as the residents there are far too respectful of their own country and their surroundings. Just a difference of respect I guess. If you’re someone from Britain you might hear the words “Nobody enjoys queuing like the Japanese” and think they’re not familiar with the British way of life. Well, I’m British and I’m telling you – nobody enjoys queuing like the Japanese. People queue for restaurants over an hour before they open. People queue for curried popcorn at Disney Land. People queue for the toilet to such an amount that on several occasions I saw a man whose job can only be described as Toilet Queue Co-ordinator. Yet these are not disorderly queues. There have never been better organised queues than the queues in Japan. I sometimes wondered if people were just queueing for the sake of queuing, or maybe to join another queue. You’ll immediately see the benefit of this when you get on your first train. Such is the efficiency of the trains, they stop at exactly the correct position on the station every time they arrive. As a result, there are designated queuing zones that people line up in before the train arrives. People getting off the train have space to exit, and there’s no chance of pushing and shoving when the time comes to board. In quiet times it is bliss. Everything you have heard is true. You will be shoved into the train and just as you think there is no more room, ten more people will get on. If they don’t fit, a man will come along and shove them in with a brush-like tool and make damn sure they fit in. People are as polite as they can be, but there’s only so much you can do when you’re so tightly-packed. Everywhere you look you’ll see face masks. I read somewhere that it started as a fad with people trying to avoid hay fever. 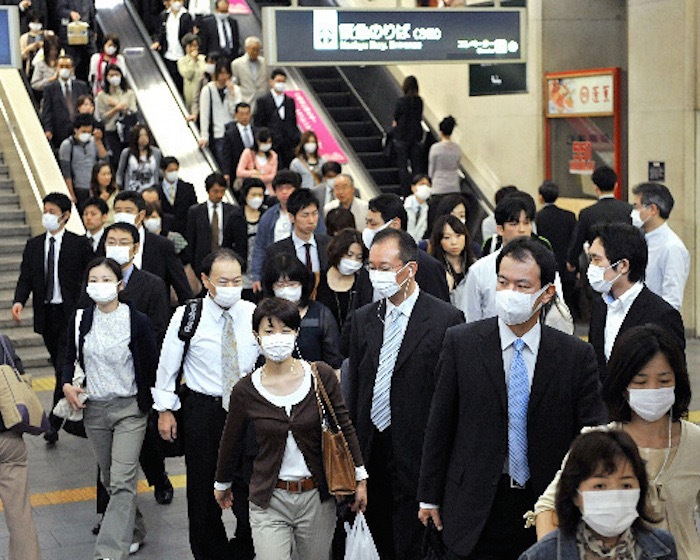 Then it caught on as people realised they could avoid getting illnesses on the subway (often people in Japan don’t get paid sick leave by their employers). Nowadays you’ll probably see about 1 in 3 people wearing these on the subways. Don’t worry – you haven’t woken up in a zombie apocalypse. It’s just that they don’t want to breathe in your filthy germs. Just try not to get annoyed at that one guy coughing and sneezing everywhere without a mask on. As this is website is primarily a film blog, it is likely you are a fan of cinema in general. 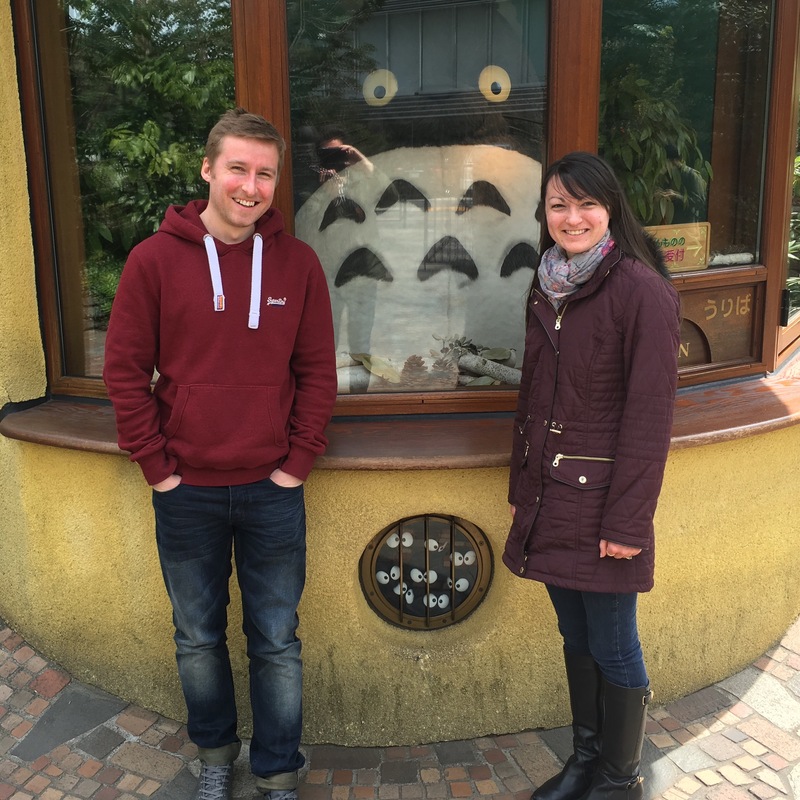 If you like films and are planning a trip to Japan then it’s likely you’ll want to take a visit to the Ghibli Museum in Mitaka. Your decision of when to visit with regards to Mt. Fuji or the sakura could be made if you want to visit the museum as it shuts in May for two months whilst the new exhibition is prepared. This was a priority for us so we opted for a March/April visit. Massive fans of Ghibli who are here for a long time may wish to do two trips to the museum: once at the start of the holiday and once at the end. Going twice will mean you may see two different short films. It is recommended that you plan to visit it for around three hours. There is a lot to take in and it would be a shame to feel rushed whilst doing it. There are two Disney theme parks in Tokyo: Disneyland and DisneySea. If you have children then make sure you go for the former, which is essentially very similar to Magical Kingdom in America. 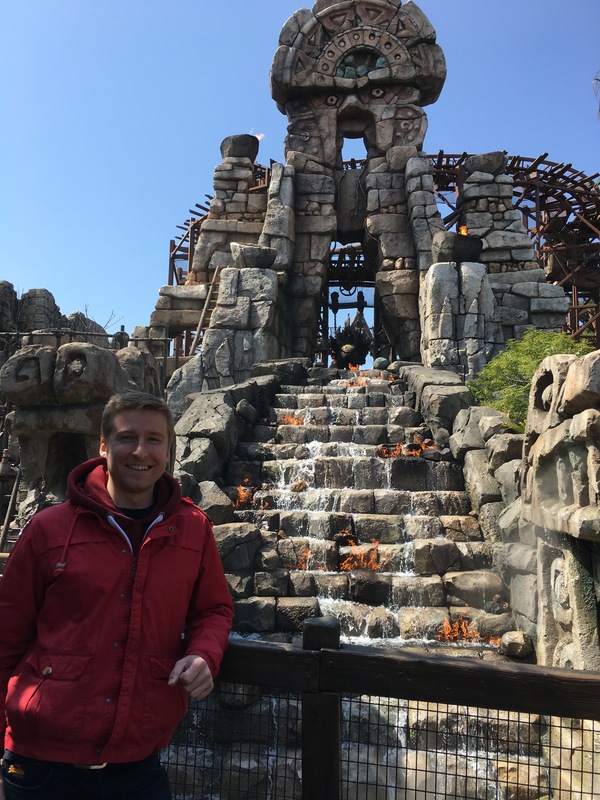 If you’re looking for thrills then DisneySea is the better option. Contrary to most advice found online, it can be done in one day as long as you’re willing to go on a couple of rides with a single rider pass. 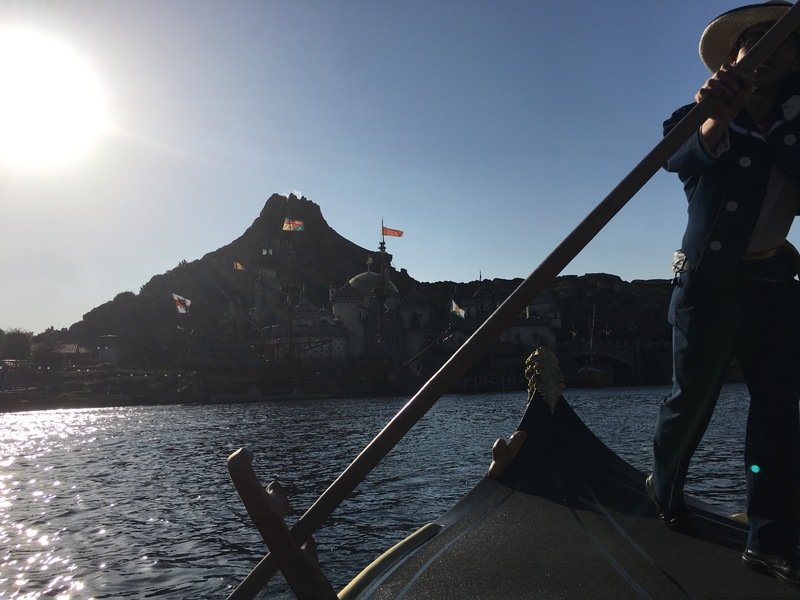 I wrote an expanded guide for DisneySea here as we got a lot out of it in a day. It’s extremely difficult to get hold of tickets to these if you don’t live in Japan. Check out BuySumoTickets.com to find the schedules for the biggest upcoming tournaments. There are six large tournaments every year: three in Tokyo, one in Osaka, one in Nagoya and one in Fukuoka. They’re quintessentially Japanese experiences and a must-do for anyone visiting Japan. The Kabukiza Theatre in Tokyo is the primary theatre in Tokyo to watch traditional kabuki theatre. The theatre is stunning both inside and out, designed in a traditional manner despite the many reconstructions over the years. Seeing a show there is a must for anyone visiting Tokyo wanting to see traditional Japanese theatre done properly. Kabuki is a traditional form of Japanese entertainment. The name literally means sing-dance-skill. It was allegedly first performed in the 17th century and has continued to be popular throughout the intervening period. Theatrical productions in the kabuki style tend to be in five acts. They are typified by stark make-up and fanciful costumes, with performers striking “mie” (kabuki-style picturesque poses) as they deliver their lines. Audience members will shout out the actors’ Yagō (house name) to show their appreciation. The stage consists of a typical framed stage as you’d expect in any Western-style play. Uniquely, however, kabuki theatre stages have a hanamichi – a walkway protruding out of the stage on which performers make dramatic entrances and exits from the stage. Each month a new programme of single act shows is performed, making up approximately four hours of performances in the afternoon and four hours of performances in the evening. Multi-act tickets for either the afternoon or evening performances can be bought in advance either at the box office or online, though those only wanting to see a single act can turn up at pre-determined time slots to buy cheap single-act tickets from the box office. This is the option we chose. A word of warning on this – they operate a queuing system and only 150 tickets are available for each act, with only the first 90 getting seats. The remaining 60 stand behind the seats. It is also almost impossible to get tickets in this way for consecutive acts as the timeslot for the next set of tickets usually lands in the middle of the prior performance. Basically, if you want to see the whole show you need to buy in advance, though for newcomers one act is usually enough. For 1000 JPY you can also rent an English subtitle box. This is essential for your enjoyment of the show and can’t be recommended enough. The Kabukiza Theatre is located in the Ginza area of Tokyo. 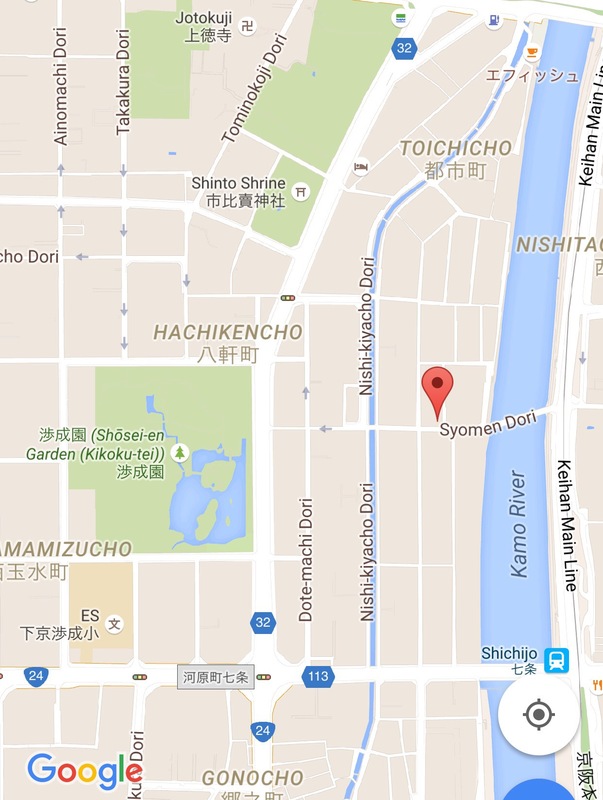 The best subway stop to reach it is at Higashi-Ginza station on the Toei Asakusa Line. The main box-office is located in the subway station along with a small market and several coffee shops and restaurants. Single-act tickets must be purchased upstairs at the dedicated box office outside the theatre. ‘Hikosan Gongen Chikai No Sukedachi’ is a single-act play that is showing at the Kabukiza Theatre throughout April. It makes up half of the evening performance, with a second unrelated story following. The storyline centres around Keyamura Rokusuke (Kataoka Nizaemon), a farmer and master swordsman living at the base of Mt. Hiko, who we are introduced to shortly after the death of his mother. A proclamation has been made that any man who can defeat Rokusuke in a sword fight will be put into immediate employment by the ruler of Kokura. One night, when Rokusuke is praying for his mother, Mijin Danjo (Nakamura Karoku) a masterless samurai passes by with his old mother. Danjo asks Rokusuke to let him win the sword match under the premise that it will show him to be a good son to his mother, who is close to death. Rokusuke is touched by this suggestion and immediately promises to throw the fight. However, once the fight is thrown, Rokusuke discovers that Danjo isn’t as trustworthy and honorable as he first thought. At one hour and thirty-five minutes, the play was a perfect length for someone new to kabuki theatre. As an English speaker who couldn’t really pick up most of what was being said in Japanese, the subtitles worked perfectly well. 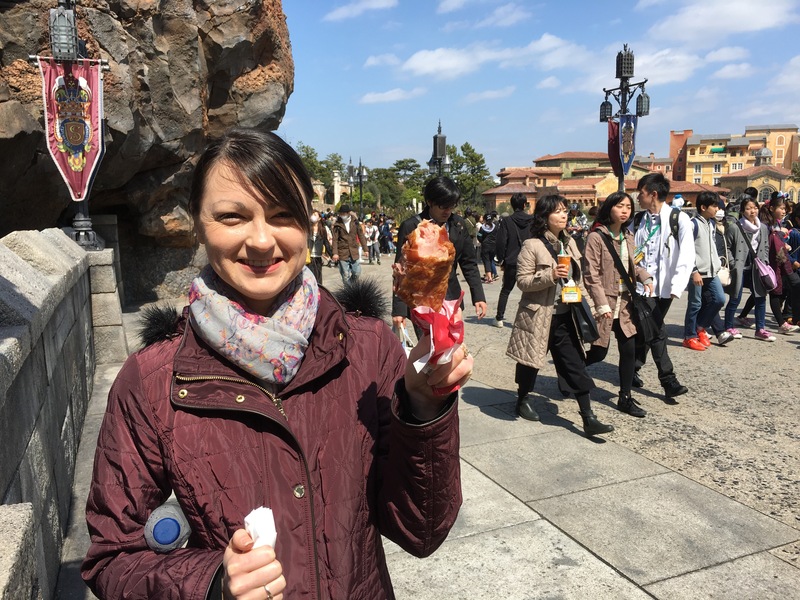 It is a uniquely Japanese experience that doesn’t, in truth, compare to anything I’ve seen anywhere else. However, that doesn’t mean it’s difficult to access and within a few minutes I was completely engrossed in what was going on on stage. Kataoka Nizaemon XV is a popular kabuki actor and his nuances were well received by the audience. He was recently awarded with the title of National Living Treasure in Japan. This is really a one-man-show and he carries it perfectly, utilising moments of real sorrow for a man missing his mother and juxtoposing them with tremendous comedy as he deals with the various women residing at his home as well as an adopted son. If you enjoy surprises it is advised that you don’t read the synopsis before you go in as it very much reveals everything you will see performed, including the conclusion of the final act. Indeed, this is a play that ends on a cliffhanger without playing out the story to a defined conclusion, leaving the audience to take the story on in their own heads to wonder and assume what happens to the featured characters further down the line. This may come as a surprise to those expecting a satisfyingly concise ending, but this is a performance that sticks to the original script rather than tinkering to please modern audiences. As an art form, kabuki is more accessible than most would expect and the opportunity to see it in Japan should be seized, especially with great seats available at such reasonable prices. It’s something I hope to enjoy again in the future and hope you do too. 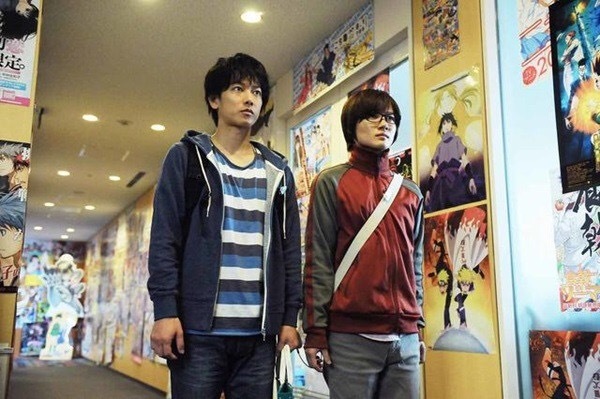 バクマン。/ Bakuman is a 2015 Japanese film based on a serialised manga of the same name. It depicts the exploits of two Japanese junior high school students, budding artist Mashiro (Takeru Satô) and aspiring writer Takagi (Ryûnosuke Kamiki), as they form a partnership to become mangakas for Japan’s most popular weekly Manga magazine Shonen Jump. 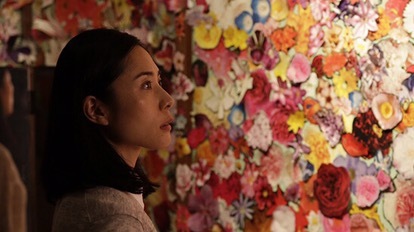 The film, like the manga on which it is based, is laced with introspection. The subject matter is such that the original manga was about two boys wanting to write for Shonen Jump, though it was serialised in that very magazine. The risk therefore is that it could have romanticised working there, but that couldn’t be further from the truth. Conversely, I was wondering how they ever got it signed off by Shonen Jump since working there seems to pose serious risks to ones health. The overarching storyline is a romantic-comedy, because artist Mashiro is driven by the hope his success will be met with that of Azuki (Nana Komatsu), an aspiring voiceover actress with whom he has a pact should they both be successful. Whilst this is slightly by the numbers, the real magic comes from the attention given to the artistry and skill involved with making manga. I’d go as far as saying this is a perfect place to start if this is a career you want to go down as it gives you a warts-and-all depiction of how these artists live their lives. There are some brilliant sequences involving the main characters as they battle against a rival artist in a nightmare world of manga artwork and paintbrushes that do for Japanese art what Scott Pilgrim did for videogame culture in 2010. There might not be a lot in this for people who aren’t fans of manga or anime, but anyone who has ever picked up a copy of Shonen Jump would really find a lot on offer in this homage to the struggling manga artists at the magazine. 1933, guide, hanafuda, how to find, Japan, Kyoto, original HQ, Original Nintendo Building, yakuza, Yamauchi Nintendo & Co.
Today I managed to track down the original Nintendo HQ building in Kyōto. 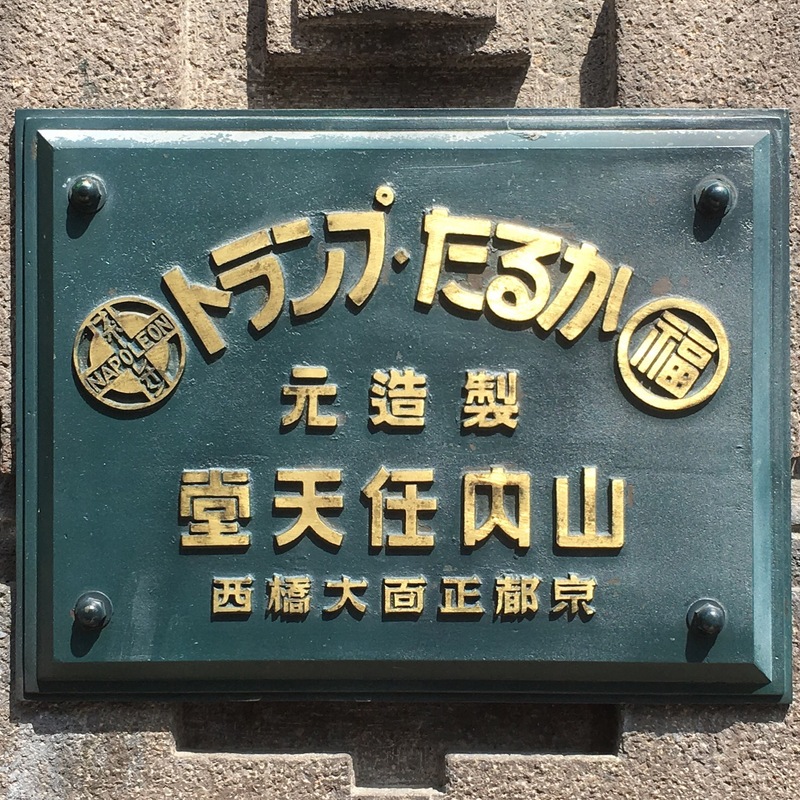 I say original, but really it’s the building built in 1933 when the company had become known as the Yamauchi Nintendo & Co. and were manufacturing hanafuda for the local yakuza with whom they were extremely popular at the time. He original HQ was in an office block and has since been bulldozed. Here’s a photo of me outside. Here’s a photo of the Japanese sign, which doesn’t mean a lot to me. I decided not to push my luck and try to get inside the building, like this guy did. It has become a bit of a pilgrimage for fans of Nintendo and video games in general, offering a little more history than the more modern HQ across town. It’s a really understated trip and if you didn’t know what you were looking for you’d probably not even realise it was there. Nobody in the area seems to care about it and unlike everywhere else in Japan it’s really easy to get a good photograph next to it. It meant a lot to me to visit it, having enjoyed Nintendo games throughout my life and still getting joy from them today. Whilst I perhaps can’t dedicate days at a time to their latest releases as I did with Super Mario Bros. 3 in 1991, the fond memories I have over the years will never die and made the trip worthwhile. A must for all video games fans visiting Japan! 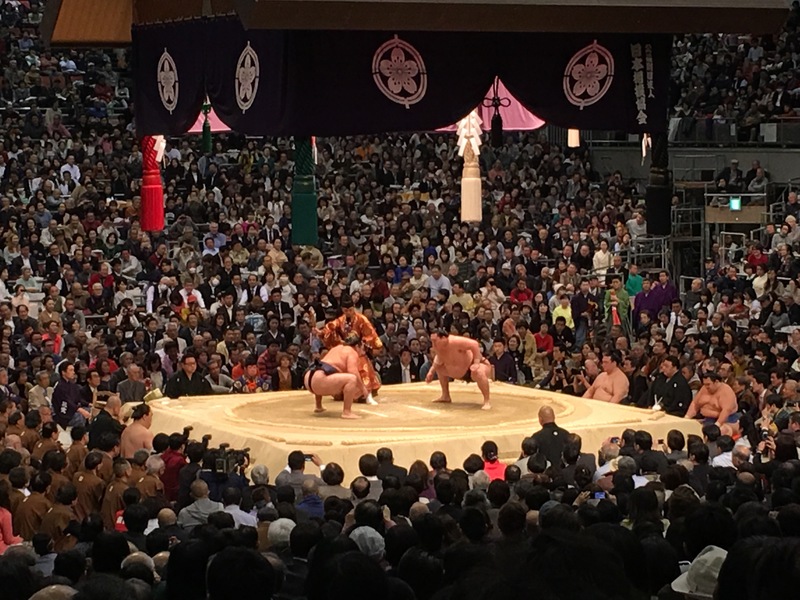 If you’re thinking of visiting Japan any time soon and you’re lucky enough to land your trip at a time when the sumo tournament is on, you need to make sure you go. To absorb yourself in Japanese culture completely, you should consider all aspects and in a country where sport is so important you might as well opt for a uniquely Japanese sport rather than football or baseball. We went on the 13th day of the tournament, which is the business end of things. 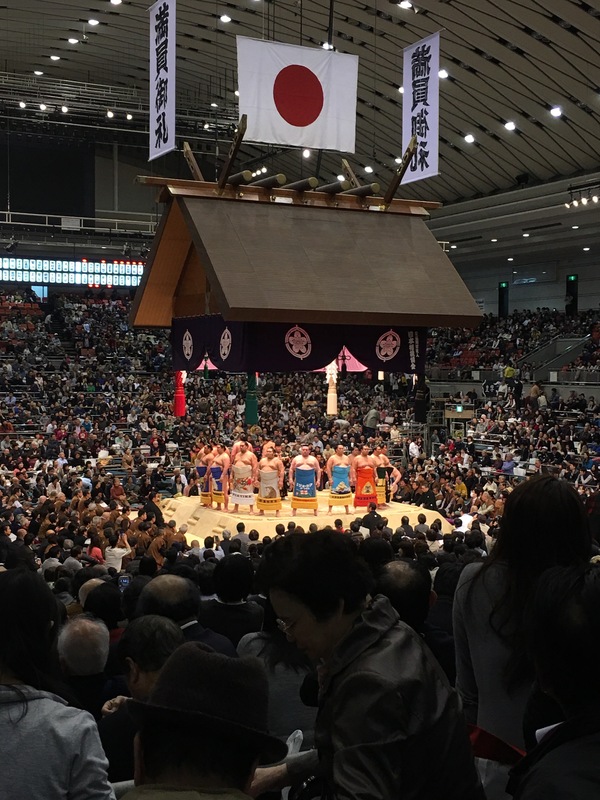 Basically, the format of these tournaments is that they last fifteen days and each sumo wrestler competes against a different opponent each day. They don’t have time to compete against everyone but they don’t repeat any match ups. As each wrestler is ranked according to his status and record, the fights are split into sub-sections throughout the day. In a nutshell, you can get into the arena from 08:30 but the best wrestlers won’t fight until about 15:00. Since we were travelling over from Tokyo in the morning, we went to the arena at about 13:00 and didn’t feel like we missed anything, seeing the tail-end of the Makushita Division fights (3rd division), all of the Juryo Division fights (2nd division) and all of the top level Makuuchi fights. Do I need to know anything about sumo? The sport of sumo is very easy to figure out, and it’s made easier by the fact that the fights come thick and fast so you can pick it up on the day. In simplistic terms, the aim is to get your opponent out of the ring or on the floor. Only the soles of the wrestler can touch to floor at any time. You will be able to follow the events unfolding before your eyes with a piece of paper with all the match-ups written out and the form of the wrestlers included so you can see the favourites. The wrestlers from the east are always on the left and the wrestlers from the west are always on the right (though the east/west placement is arbitrarily handed out to the wrestlers regardless of hometown). Sumo isn’t just about the fighting. There are a lot of rituals that each wrestler must go through and they are followed before each and every fight. The build up to each fight lasts several minutes and the fights rarely go over ten seconds. Who are the big stars? In over 300 years of the sport, only 69 fighters have been awarded the Yokozuna title, though this has only been recognised as the highest rank for around 100 years. They achieve this by winning two grand tournaments in a row (there are only six per year). There are currently three Yokozuna fighters: Hakuhō Shō, Harumafuji Kōhei and Kakuryū Rikisaburō. All three are from Mongolia. When these fight, you know about it as the whole stadium erupts with delight. This is never more evident than with Hakuhō, the most successful sumo wrestler in the history of the sport. We were lucky enough to see him fight against Kakuryū, another Yokozuna, and come out victorious. There are six tournaments throughout the year: three in Tokyo (January, May, September), one in Osaka (March), one in Aichi (July) and one in Fukuoka (November). There isn’t much choice of food once you’re inside the arena. 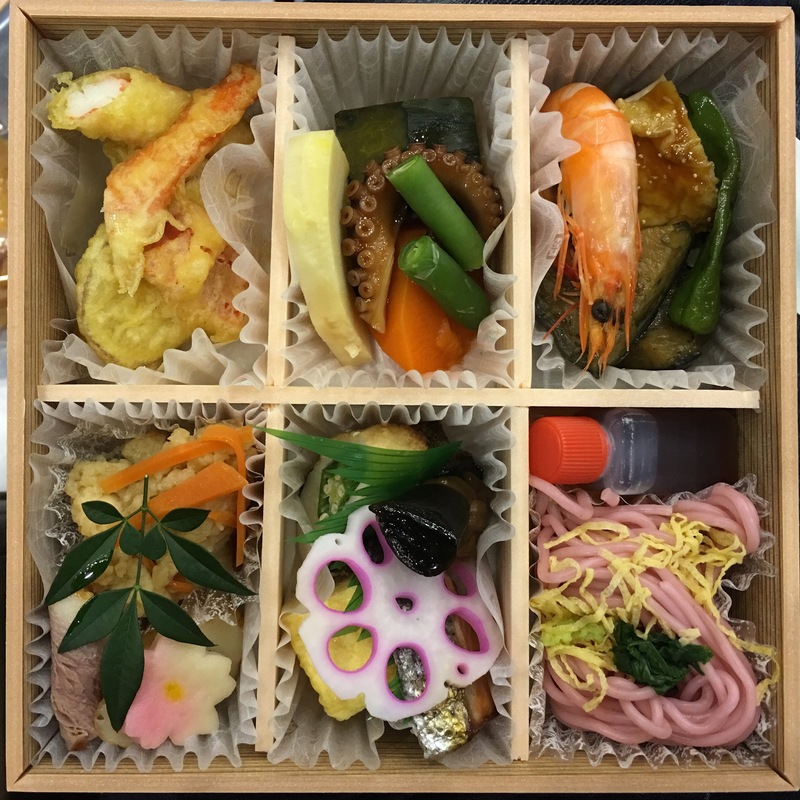 Other than ice cream sold by vendors walking around the ground, you’re pretty much limited to a bento box if you’re looking for something substantial. These cost around ¥2100 (£15), but they include a whole host of cold Japanese snacks you can eat with the chopsticks provided. Here’s an example of what you’d expect to find. If that doesn’t take your fancy, then you can wait for the tournament to finish and head of the arena in any direction and find heaps of restaurants with every type of food to take your fancy. I’m not even going to attempt to list them as there are too many to choose from. This is the tricky part. Sumo tickets sell out almost instantly, especially for the latter days of the tournament. It’s impossible to buy tickets from the official website if you don’t live in Japan. There are, fortunately, some 3rd party dealers who will help you get tickets. The one I used was www.buysumotickets.com, and the tickets were paid for with a small commission fee and were in hand within a few days. Really helpful service and sorted me out with alternative tickets when the ones I wanted weren’t available. If you get chance to go to Japan and happen to be there when one of these tournaments is on, then it’s a must-do experience. Now is a great time to experience sumo, with three Yokozuna all competing at the same time. I went for one day and I’m now converted, wondering how I’ll see the next tournament from the UK!